The Stanford Concert Network (SCN) put on yet another successful Frost Music & Arts Festival last Saturday, featuring performers Charles Calvet, Broods and Zedd. Due to renovations, this year’s festival was moved from its namesake, Frost Amphitheater, and was instead held at Stanford Stadium. I’d heard about the magic of Frost Amphitheater: the feeling of escape and seclusion, a unique place within Stanford that feels like anything except Stanford. Though this was my first time at the festival, I wondered if it would be possible to preserve that same liberating feeling. I’m not sure that the Stanford Stadium was the best choice for such a concert. Outdoor EDM concerts often evoke images of bodies packed onto a standing-room only floor, hands waving in the air, people relaxing in the back on the grass – there ought to be a free, festive vibe. Instead, this venue felt a little strange: To the back of the main stage were thousands of empty seats and an empty field, which made the event feel small. Nevertheless, the music quickly uplifted my spirits, and I quickly forgot about the slight awkwardness of the venue. Charles Calvet ’17, the student opener, kicked off the afternoon with some fresh pop and electronic tracks. Calvet, himself is no stranger to the stage, with a performance at the annual Snowglobe festival at Lake Tahoe under his belt, as well as countless shows at campus parties. He laid down a mellow and playful vibe, breathing little bits of life over the crowd, but it never became too exciting. There was, after all, hours of music to come. As the music gently eased the growing crowd into the festival, Calvet took the chance to show off his guitar prowess, effortlessly picking out riff after riff as students cheered him on. Broods was an excellent opener as well, instantly captivating the crowd with wave after wave of powerful, emotive music. Their entrance was hard to miss: Above the hubbub of the chattering crowd, there suddenly came a single bass note, rattling everyone’s hearts as they looked up anxiously, waiting for more to come. 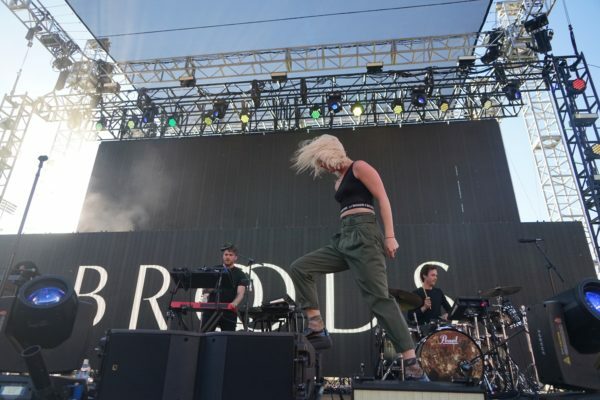 Soon we were all rewarded as Broods took to the stage, playing the crowd with familiar tunes like “Bridges” and “Heartlines,” replete with their signature echoing beats and spacious synth chords. Georgia Nott, Broods’ lead singer, was obviously not only a career musician, but also a career performer. Her onstage ethos was fun to watch, exuding confidence and playfulness as she bounded across the stage. One moment she would be belting plaintive cries, the next she was whispering refrains about broken promises, memories and dreams. Caleb, Georgia’s brother and collaborator, brought an unmatched energy to the stage as well: He simply looked like he was having the time of his life. He was banging his head through the whole set, hair bouncing to the beat as he passionately teased power chords and riffs from his keyboard. Broods somehow managed to straddle a knife-edge with the emotion of their performance: Any less, and it wouldn’t have seemed genuine, but any more, and their performance would have taken on a laughably faux-emo aesthetic. But they found a perfect balance with no trouble: an elegant combination of catharsis, hope, despair and freedom. I’d never heard most of their lyrics or songs, but that didn’t matter – I soon found myself singing along to the catchy melodies. In fact, I almost worried that Broods would overshadow Zedd – but clearly I had underestimated just how amazing this night could get. I should say that Zedd means a lot me personally. I’ve been surrounded by music for my entire life, but five years ago, I heard, for the first time, a new type of music unlike any other. I had just listened to “Clarity” by Zedd for the first time. I was immediately drawn in: The beautiful chords, haunting melodies and pure novelty spoke to me profoundly. That song first sparked my interest in electronic music, and that was the day that I, full of inspiration, became an electronic music producer. So Zedd’s appearance at Frost this year felt almost fateful for me: I simply could not miss the chance to experience the music of the man who had forever changed my musical life. When colors began to sparkle on the screen, I knew that my five-year wait was almost over. The notes twinkled in rhythm, and a wave of chords began to flow. I’ll admit that I was a little apprehensive: What if it wasn’t as good as I expected? What if Zedd had “sold out”? But my reservations were cut short by the sound of beautiful music – new to my ears, yet all so familiar, and I immediately heard those same moments of beauty, that same profound voice that called me to the world of electronic music. Suddenly, Zedd appeared on the stage with a flourish, bathing the field in white light as the sun sank into the horizon. Not a single person remained sitting on the field as Zedd took us all on a journey peppered with thrill and wonder. Zedd’s music flowed naturally, mixing his signature pop-EDM sound with everything from oldies, today’s pop hits, his older complextro roots and even hard-hitting techno/bass drops. Song after song flowed into one another, taking us from the familiar land of pop into unexplored worlds populated by squelching bass lines and strange voices. And when the music strayed too far into terra incognita, welcome voices singing well-known melodies from oldies and pop songs brought us back to safe harbor. Zedd played a plethora of his own works: recent hits like “Starving” and “Stay,” as well as older favorites “Spectrum” and “Clarity.” Somehow, I heard those threads of Zedd I had first found appealing about him music throughout his entire set. But I also wondered at times if I was just enjoying the extravagant visuals. I closed my eyes in those moments, and unfailingly heard thousands of thundering voices screaming familiar refrains, taking in the music breath by breath, word by word, and I knew that it was the music – and the music alone – that made me move. As night unfolded, the crowd only became more energetic, prodded by ceaseless beats pounding dances into our bodies. 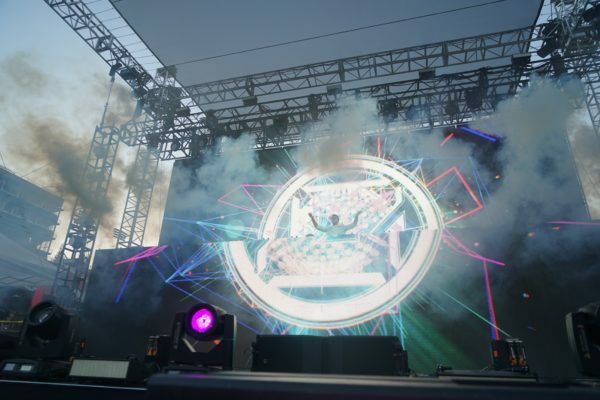 What amazed me most about the performance, however, was how Zedd simply had no regard for musical labels – future bass, electro house, trap, hardstyle and many other genres made brief, crowd-pleasing cameos in his set. Despite the brief blunder of playing an unadulterated version of “Closer” by the Chainsmokers in its entirety, Zedd executed these surprising transitions with amazing spontaneity, without the slightest hiccup or inaccuracy. One moment I was dancing to Michael Jackson’s “Thriller,” the next Martin Garrix and Florian Picasso’s “Make Up Your Mind,” then Missy Elliot’s “Get Ur Freak On” and then a strange bass house track – who but Zedd could have joined these disparate artists into a harmonious, musical union? 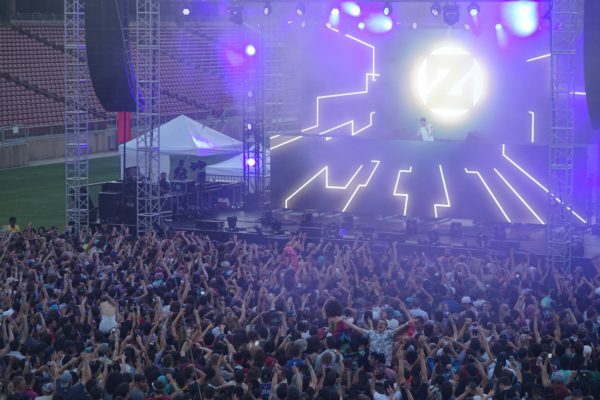 The night ended all too soon – the beats ceased, and Zedd thanked us all to thunderous applause and cheers. We stood there under the blinding lights, waiting for the inevitable encore – but there was none to come. I calmed down, and only then noticed that my feet were sore, my voice was hoarse and my ears were ringing, so I trudged back to my dorm room, weary from the excitement of the night, head spinning with fresh musical hopes and thoughts. To Zedd, and all the other performers, organizers, mixing engineers, graphics artists, talent agents, stage crew and others who made this experience possible, thank you. Thank you from the bottom of my heart.